This book is highly recommended for a deeper understanding of Hamilton's developments and for giving context to local newspaper articles on current issues. I'm always pleased whenever I actually manage to read a whole book in the same year it's published. Somehow, temporarily, I feel as though I'm inhabiting a moment of the so-called present rather than striving to catch up or hurry forward. So I'm quite happy that I finished Hamilton: Brutal Beauty, Hidden Heritage Guide before the end of 2013. Fortunately, despite the long title which I now take the liberty of abbreviating, Hamilton BBHH Guide is really quite short at scarcely 100 pages. Factor in almost 150 photographs and over 40 maps ... well, I suppose I can't take much credit for finishing such an easy read. What impressed me about the ease of reading was the realization that the author, Ian Dunlop, had obviously done all the hard work of curating content - and a lot of it at that - to create such a cohesively informative guidebook. Mr. Dunlop published Hamilton BBHH Guide as his Masters thesis project. Now, to be frankly stereotypical, seeing a book's preface page start with "This Major Research Project" in capital letters and end with "University of Waterloo", I expected an astonishing amount of technical information. In this regard, the book delivers! Hamilton BBHH Guide definitely benefits from Mr Dunlop's scholarly presentation of the city. The text is both densely detailed and concisely focused on the theme he's chosen: infrastructure as the foundation for explaining Hamiltonian history and progress. He deftly explores the interplay between transportation, architecture, geography, history, economics, renewal and growth. The neat trick is that he writes it all in a very clear, informal, easy-reading style. 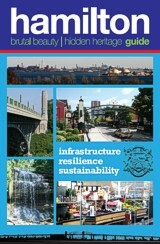 In addition to the written info, Hamilton BBHH Guide showcases Dunlop's professional expertise in mapping and design. More than forty maps present Hamilton's geographic details very comprehensibly with clear labels, highlighted points of interest and excellent legends. With an eye to presenting relevant visual information, the author's use of various map styles is impressive. Rounding out the text and maps, this guidebook is filled with photographs that are cropped to show some really charming vignettes and cityscapes. Many close-ups reveal a way of seeing that quietly celebrates Hamilton's architectural history through iconic images. These photos are balanced nicely with other snapshots of less obvious details that give texture to the city. Almost all the photographs are cross-referenced extensively with the maps and text (watch out, Eyewitness Guidebooks). In addition to the index, as expected of a "Major Research Project" there are three pages of references in really tiny print for those interested in further information. For this reader, the easy-read version of Hamilton BBHH Guide was more than sufficient for 2013. Hamilton BBHH Guide is highly recommended for a deeper understanding of Hamilton's developments and for giving context to local newspaper articles on current issues. Joy Jones is learning to remember that in Hamilton, the lake is to the North. She particularly likes the street in the top photo on page 38 of Hamilton: Brutal Beauty, Hidden Heritage Guide. I haven't seen this book, I don't know why not as it's been around for a while. After looking at some sample pages I find it very succinct. Good as a portable field guide, which seems to be the intention. Also good for infrastructure is Disher and Smith's By Design: the role of the engineer in the Hamilton Burlington Area. ( Hamilton Engineering Interface, 2001). At 191 pages with lots of pictures and very clear maps it is just big enough. For the actual performance of the work that built the place, a good overview is All That Our Hands Have Done: a pictorial history of the Hamilton workers ( Heron, Hofmitz, Roberts, Storey, Mosaic Press, 1980). Despite the subtitle, this has enough text to keep you oriented. The images are of men, women, and children producing the world of electric motors, tires, cigarettes, cotton clothing, pitted olives, rail cars, anti-aircraft guns and on and on, as well as many off-shift moments. The natural situation is surveyed very well in From Mountain to Lake: the Red Hill Creek Valley ( ed. Walter Peace, The Conserver Society of Hamilton and District, 1998.) Again, the subtitle is misleading as the history and geography described are much wider than that of the Valley. A good companion to this book is Natural Landscapes of the Dundas Valley ( Richard and Eleanore Kosydar, Tierceron Design, 1989.) And of course for the Iroquois Bar there is John Terpstra's Falling Into Place (Gaspereau Press 2002), a handsome volume in all ways. For politics the best introduction (not everyone would agree) remains Their Town: the Mafia, the Media and the Party Machine (Freeman and Hewitt, Lorimer and Company, 1979). Unfortunately this book ends its story in the mid-seventies and there has yet to be a sequel. Most helpful for understanding the current cityscape is Margaret T. Rockwell's unpublished 2004 M.A. thesis Modernist Destruction for the Ambitious City: Hamilton Ontario's experience with Urban Renewal. This is on the shelves at Mac (Mills Library) but does not exist in authorized electronic form, which is regrettable. The newcomer who reads this 120 page essay will find there the solutions to a great many things which must be quite baffling to them when they first arrive. Briefly: we were hit by a meteor. Otherwise, thanks for great & interesting reviews of Hamilton's structural development.